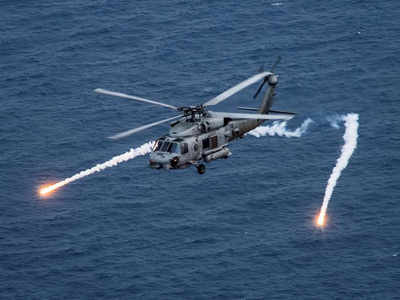 •	The United States said it had approved the sale of 24 MH-60R helicopters to India, significantly boosting its emerging ally`s firepower to target submarines as China expands in the Indian Ocean. •	In a quick reply to a request submitted late last year by India, the State Department said it was informing the US Congress as legally required that it was giving the green light for India to buy the 24 helicopters worth a total of $2.6 billion. •	Nicknamed the Romeo, the MH-60R helicopters manufactured by Lockheed Martin are designed for hunting submarines as well as knocking out ships and conducting search-and-rescue operations at sea. •	"This proposed sale will support the foreign policy and national security of the United States by helping to strengthen the US-Indian strategic relationship and to improve the security of a major defensive partner," the State Department said in a statement. •	It called India "a major defensive partner which continues to be an important force for political stability, peace and economic progress in the Indo-Pacific and South Asia region." •	In a strategy dubbed by Indian and US observers as the "string of pearls," China has made use of a growing number of naval bases in the Indian Ocean, most notably the Gwadar port it is developing in India`s historic rival Pakistan.